Ekta Kapoor baby naming ceremony: From Karan Johar, Abhishek Bachchan, Bobby Deol to Divyanka Tripathi, Anita Hassanandani, Smriti Irani, Erica Fernandes and many more to add to the list of celebrities who attended the grand star-studded Ekta Kapoor's baby boy Ravie Kapoor's naamkaran ceremony on Monday, February 11. 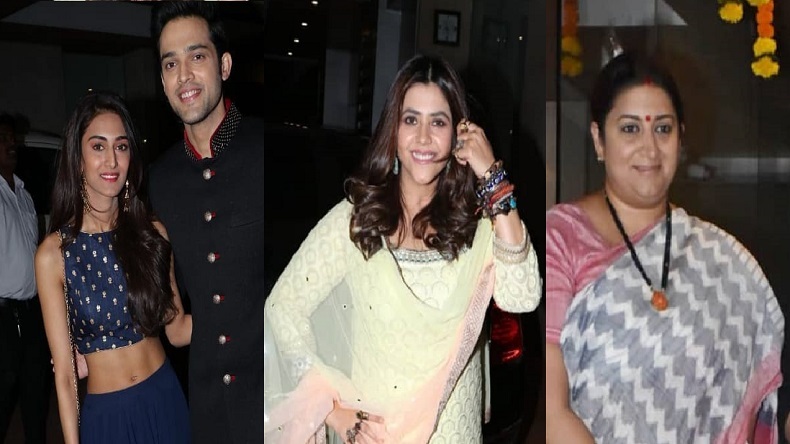 The pillar of Indian daily soaps, mommy Ekta Kapoor hosted a naamkaran ceremony for her newly born son Ravie Kapoor at her Mumbai residence on Monday i.e. February 11. From television stars to Bollywood personalities were seen attending the grand star-studded event, last night. While Ekta Kapoor, father Jeetendra and mother Shobha Kapoor were seen dressed in traditional attire, brother Tusshar Kapoor and son Laksshya stuck to their casual attire in all smiles. Right from television stars like Kasautii Zindagii Kay actors Erica Fernandes, Parth Samthaan, Pooja Banerjee, Anita Hassanandani along with Rohit Shetty, Divyanka Tripathi, Vivek Dahiya, Karan Patel, Mouni Roy, Shabbir Ahluwalia, Kanchi Kaul, Mona Singh, Karishma Tanna, Vikas Gupta, Sriti Jha, Charu Mehra, Hiten Tejwani, Krystle D Souza, Urvashi Dholakia, Sakshi Tanwar to Bollywood personalities Abhishek Bachchan with sister Shweta Nanda, Patralekha, Farah Khan, Pragya Kapoor, Bobby Deol, Sushmita Sen, Urvashi Joshi, Preeti Jhangiani, Swara Bhaskar, Rhea Kapoor, Goldie Behl, Sameer Soni, Neelam Korhari, Smriti Irani, Huma Qureshi and Karan Johar were seen joining the family to give blessings and wishes. Well, mother-to-be Surveen Chawla too attended the affair in a beautiful pastel green coloured suit. Ekta Kapoor became a proud mother of a baby boy via surrogacy in January 2019. She took to her official social media platform to share the good news with the world. In her post, she wrote that nothing could beat the feeling of a beautiful soul being added to her world. She was overwhelmed and emotional to have a baby.